After Sundays adventure I’m hobbling around on crutches with a knee that is swollen like a water balloon and won’t bear much weight. Thankfully there’s probably nothing broken, fractured, twisted or torn, so I just have to wait for my knee to stop panicking (it has an built-in air bag that doesn’t deploy quickly enough?) and recovery might not take too long. I hope. 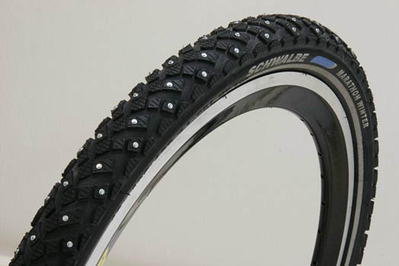 Then I shall buy these tyres (Schwalbe Winter Marathons) and laugh in the face of any ice and snow in my path. 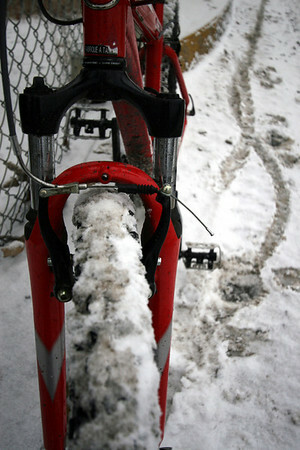 That’s one of Schwalbe’s “lite” studded tires. If you think you’ll encounter a lot of ice and snow you may want one of their more aggressive winter tires. I’d probably run the one you posted about on the back and the more aggressive one on the front as a good compromise. If you want total control get the aggressive tire on both wheels. I actually had a minion go out and check out the Canmore stores today, just in case. And one of them has the Continental Spike Claw 240s at a reasonable price, so I might just grab them. Or arrange for my minion to grab them. They’re a fairly aggressive tyre that will probably be a bit more suited to the conditions I’ll be riding – I’m really not keen on a repeat of the ice slide!